Your beautiful clematis plants that make a vivid, colorful addition to your garden, but are prone to complete devastation if infected with leaf and stem spot disease. Caused by a fungal pathogen, leaf spotting and yellowing is a sign that your plant is in danger. Fortunately, plants rarely meet their demise due to this problem, but knowing what to look for and how to act will ensure your clematis regains health. Vigorous plants are less likely to fall victim to fungal infections and more likely to have the resilience to recuperate. Grow clematis in morning sun and afternoon shade, when possible. Clematis need a minimum of six hours of direct sunlight daily for vibrant, healthy blossoms, according to the Clemson University Extension. Clematis prefers moist, well-drained soil with cool temperatures. Avoid waterlogged soil that invites the germination of fungi. Clematis leaf spotting and yellowing is a sign of a disease referred to as clematis leaf and stem spot. This problem is caused by the fungus Ascochyta clematidina with varieties producing larger blossoms as the main target. The fungal pathogens infect the stem, most prevalently near the soil line, but do not invade root systems, according to the Washington State University Extension. As its name suggests, clematis leaf and stem spot results in the appearance of spots on leaf surfaces and stems as well as the wilting and yellowing of leaves. Yellowed leaves become brown and the stem dies back. Stem damage inhibits normal water and nutrient absorption and transport from roots to the rest of the plant causing an untreated clematis plant to die, notes the Washington State University Extension. The best natural control is planting resistant varieties or species to drastically reduce the likelihood of infection. Though resistant species are not immune to leaf spotting and yellowing, choose Clematis alpina, Clematis viticella and Clematis macropetala, advises the Washington State University Extension. 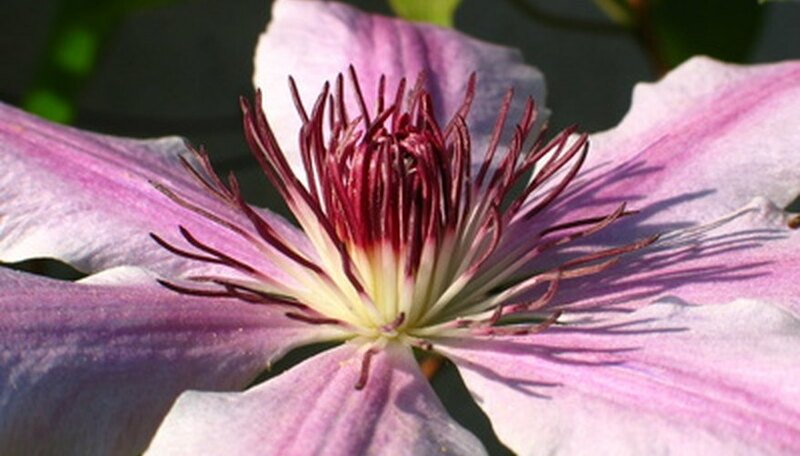 These species have smaller flowers; if your goal is to plant clematis with large blooms, maintain consistently well-drained, moist soil with the addition of organic content to deter fungi. Remove and destroy affected plant parts and sanitize pruning tools between cuts and before moving on to another clematis plant to prevent the spread of disease. In the event that your clematis is susceptible to leaf spotting and yellowing, apply a preventive fungicide as a chemical control to inhibit fungal infection. Applying fungicides to clematis for an already existing leaf and stem spot is not an effective management method. Apply a fungicide with the active ingredient sulfur to prevent germination of fungal pathogens, notes the Washington State University Extension.